The youngest Stott Pilates trainer in the world, Namrata Purohit has many celebrities and sportspeople sweating out to her instructions, making her so sought after. Pilates does total conditioning of the body, increasing flexibility, muscle strength, endurance while toning the body from head to toe. Many celebrities are taking to it owing to its all round benefits. Leading the Pilates wave in India is the 20-year-old Namrata Purohit, who is the “youngest trained Stott Pilates instructor” in the world. Having started her career at the age of 16, Nmarata today caters to quite a few known faces from the fashion, film and sports industry. Namrata believes one can relieve stress while increasing the flexibility, balance and strength. “Pilates leaves the person refreshed without necessarily sweating. It gives flat tummies, toned muscles and eases back complaints,” says the budding trainer. Namrata took to Pilates after she fell off a horse and hurt her knee bad. “Post surgery I tried various fitness forms to regain strength and stability. My father and trainer, Sameer Purohit, at that time was conducting a Pilates course in Mumbai. I joined it and in four days saw noticeable differences. Seeing its magic I became a believer in the form and decided to pursue it further,” says Namrata, whose clients include Neha Dhupia, Hazel Keech, Shibani Dandekar, Bruna Abdullah, Hasleen Kaur, cricketers like Abhishek Nayar, Dhawal Kulkarni and football players like Renedy Singh, Manandeep Singh to name a few. The fitness landscape in the country is changing very fast. It’s no more about muscle building or getting in shape; it’s the mind-body approach that interests the fitness trainers now. “Pilates is a form of mind and body exercise. You work the body inside out and every muscle in the body is worked. Running or walking requires the body movements to become automatic and one has to keep the mind totally focused on what the body is doing when she/he practises Pilates. Pilates also calls for a lot of focus on the breath. Some movements of the body are also coordinated with the breathing patterns,” says Namrata, who is a sports aficionado and has played squash at the national level and football at the state-level. Currently, she is also pursuing her graduation in Economics. Her studio, The Pilates and Altitude Training Studio, Mumbai has been the official fitness expert to The Femina Miss India International pageant since 2011. Pilates can have different meaning and purpose to different people. It can be practiced for remedial reasons, as part of a sports training programme as well as to improve posture, as part of a balanced exercise regime. Having a strong, supple core will allow the muscles to develop real strength. This creates a feeling of well being and helps prevent both minor and major injuries. Stott Pilates is contemporary approach to Pilates. It is one of the most recognised schools of Pilates worldwide. But a word of caution: “Always practice Pilates in the company of a professional. Also they can customise it to the body type and desired goal. And with the wide range of exercises they can keep motivated and guessing,” she advises. With over 500 exercises to teach it can never get boring. “Also, Pilates can compliment other forms of exercise and one will start seeing the difference in strength in no time,” signs off Namrata. ■ Pilates develops fluid rhythm while transitioning from one exercise to another. Even with striking similarities, Yoga and Pilates have their differences. Yoga lays thrusts on poses, while Pilates uses movements. 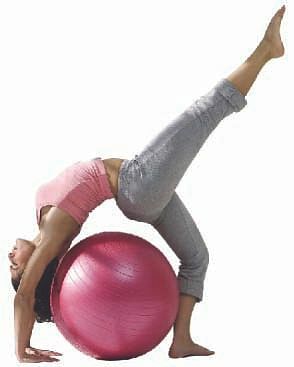 Pilates emphasises toning over flexibility while Yoga emphasises flexibility over strength. ■ Burns 200-400 calories depending on the class.